With summer at an end, and the garden wrapping up, a great way to use those fresh vegetables is with a tasty ratatouille. There are multiple ways to prepare this dish, but the simplest way is to simply saute all the ingredients together. Finely dice 1 large red bell pepper and 1 pound of mushrooms. Saute in a large skillet with a few tablespoons of oil over medium-high heat while you prep the other veggies. Finely slice 2 large carrots and add them to the skillet. Chop 3 large zucchini into bite sized pieces and add them to the skillet. Dice 2-3 tomatoes and add them to the skillet. Finely chop 2-3 cloves of garlic and add them to the skillet. Cook until the zucchini are tender, then add fresh thyme (2-3 sprigs worth). Keep warm while you cook the salmon. Heat a second large stainless-steel skillet over high heat with enough oil to completely cover the bottom. 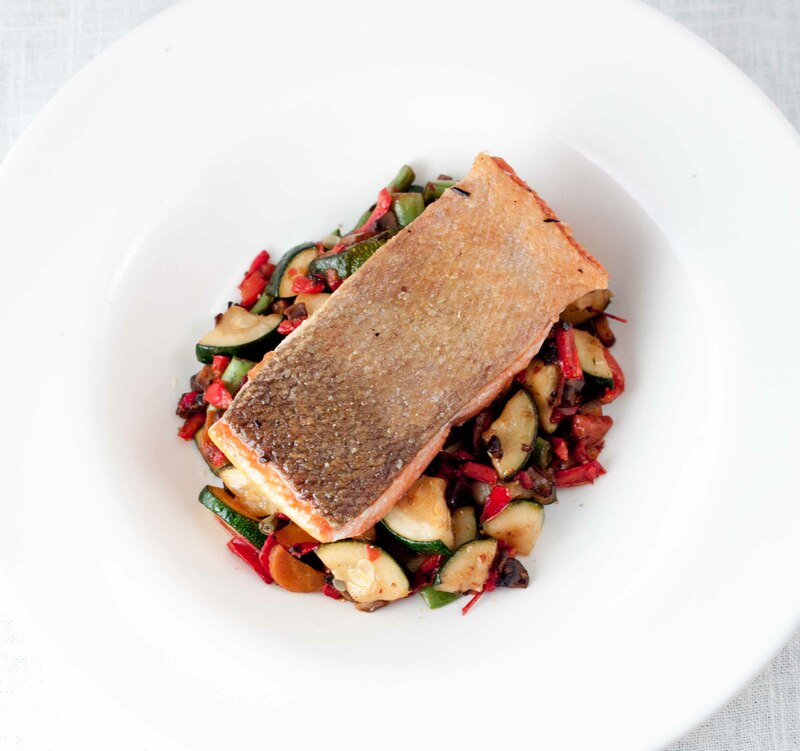 While the oil gets very hot, make sure the salmon skin is very dry. Once the oil is ready, carefully add 4 skin-on salmon filets, skin-side down, pressing on each piece for 15-30 seconds to ensure the entire layer of skin is in contact with the pan (the bottom of another clean skillet works well, or a flat plate). Turn the heat down to low and cook the salmon until the flesh turns light in color, about half-way up the filet. Give the pan a little jiggle to release the filets (if they stick, use a metal spatula and very carefully help it along), and flip the salmon. Cook for another 30 seconds or so, then remove from the pan. 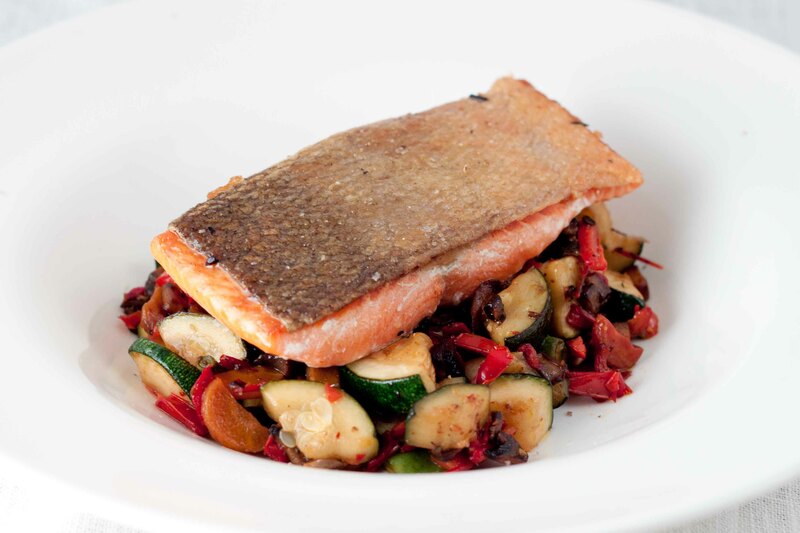 To plate, add a few scoops of the ratatouille to the plate, and top a salmon filet. Sprinkle with a pinch of lemon zest. Note: a traditional ratatouille would include eggplant. I didn’t have any, so I didn’t use it. Basil and marjoram are also traditional herbs to use, but I prefer thyme.